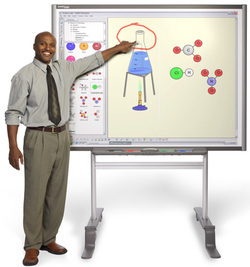 This page has resources that should help get you started using a Smart Board and the Smart Notebook software with your students. There are documents, videos, example lesson files, and links to places where you'll be able to download previously created lessons for free. It's important to get a basic understanding of both the hardware and software so that you can maximize your ability to use them in engaging ways with your students. This file has examples of items from the Lesson Activity Toolkit as teachers would use them with students. This file has ideas, examples, and directions for creating visual effects such as reveals.